Corda Nova Baroque is an early music ensemble that focuses on bringing lesser known 17th-18th century musical works to wider audiences in a historically informed manner. Corda Nova's successful first season included programs of German Stylus Fantasticus works and Italian sonatas in Washington DC, Middleburg, VA and Philadelphia. The ensemble's second season included performances with soprano Rebecca Mariman and French Baroque selections performed in Washington DC, Princeton NJ, and the group's New York City debut on the GEMS Midtown Concert Series. The trio formed in 2012 after working together in the Early Music program at Peabody Conservatory and also at the Amherst Early Music Festival. In 2018 J.T. Mitchell (baroque flute and recorder) and Gabriel Benton (historical keyboards) joined Corda Nova Baroque, and the ensemble now performs in a variety of chamber music configurations. 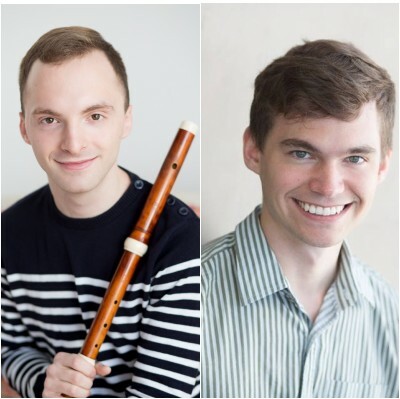 We are pleased to announce the addition of two fantastic musicians, JT Mitchell (baroque flute, recorder) and Gabriel Benton (historical keyboards) to the Corda Nova artist roster for the upcoming season. We are looking forward to some exciting concerts!